If you have any questions regarding Juvenile Defense, please contact us for a FREE JUVENILE ADJUDICATION CONSULTATION. 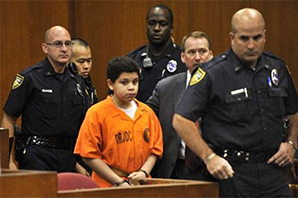 Once a case proceeds to juvenile court, a jurisdictional hearing is held in which the juvenile admits to or denies the allegations. Adjudication is the court process that determines if the juvenile committed the act for which he or she is charged. The term adjudicated is analogous to convicted and indicates the court concluded the juvenile committed the act. At an adjudication hearing, the court hears the evidence and testimony pertaining to the case and the judge decides whether the youth should be adjudicated. At an adjudication hearing, the district attorney presents the evidence to a juvenile court judge. At this hearing, the juvenile is guaranteed the rights of due process and privilege against self-incrimination. If the proceeding results in a failure to adjudicate, the petition might be dismissed and the case could be considered closed at that point. Even if not adjudicated, a case may be continued in contemplation of dismissal. For instance, the court could recommend that a youth do something prior to dismissal of all charges, such as paying restitution or voluntarily attending drug counseling. Such a case would not be considered complete until the youth followed through as instructed and the charges were dismissed. Cases that result in adjudication are sent forward for a disposition hearing. At the disposition hearing, the court determines the most appropriate package of services and sanctions for each youth. Options often include commitment to an institution, placement in a group home or other residential facility, probation, referral to an outside agency, community service, and fines or restitution payments. Ideally, the disposition is designed to protect the public safety as well as address each youth's individual needs and characteristics. If you need an effective Juvenile Defense Attorney, please contact us for a FREE JUVENILE ADJUDICATION CONSULTATION.